Overhead source capture air filtration systems are the recommended industrial hygiene approach to controlling welding fumes. Source capture arms are positioned to draw the contaminants away from the breathing zone at the source, thus minimizing the amount of air required. These source capture arms are articulating, with 360 degree maneuverability for maximum versatility. Small industrial electrostatic unit. Suitable for ambient or source capture use. Small industrial media filtration system. Longer than M32 version to accommodate longer bag filters. In-duct (blowerless) media unit. This is more commonly used as a module (configured with other modules to make a complete air cleaner). Portable, small industrial electrostatic unit. Suitable for source capture. Small industrial portable source capture system. Slightly taller than M32V to accommodate longer bag filters. Electrostatic precipitators utilize permanent electronic collector cells to ionize and collect the welding fumes and grinding dust. This style eliminates the need for future filter replacements but will require periodic maintenance to maintain their efficiency. These air filtration systems require smaller motors and are thus highly energy efficient, making them the best value over the long term. 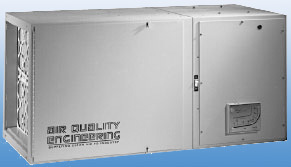 Air Quality Engineering, Inc offers an overhead, source capture electrostatic model, the F73, a larger, electronic air cleaner for those high demand applications with up to 6,000 cfm capacity for multiple users. Disposable media type air filtration systems utilize multi-staged filters to maximize filter life and achieve high efficiency. These systems require little maintenance and have a lower capital cost. 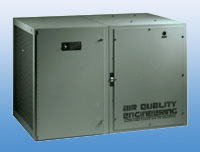 Air Quality Engineering offers the versatile M66 air filtration media system with up to 3,000 cfm. This versatile workhorse can be configured with many different motor/blower combinations and a variety of overhead, or wall mounted source capture arms. The M68 air cleaner is the ultimate in high efficiency for those OSHA regulated heavy metals (Cadmium, Beryllium, Zinc, Lead, and hexavalent chromium). Its true seal HEPA filter provides 99.97% efficiency. The largest ambient air cleaner with disposable filters is our M73 with a capacity of up to 5,000 cfm for multiple users. The reverse jet cartridge air filtration systems are ideal for heavy welding applications to maximize production and minimize maintenance. The AQE4000 overhead cartridge system has a 2,500 cfm capacity and is ideal for two stations. This unit includes all necessary control circuitry and comes standard with a 1 cubic foot cleanout drawer. 11′ and 14′ overhead arms are available with 360 degree maneuverability and may be purchased with optional dampers and hood lights. Other available accessories include spark arrestors, floor stand, silencer, hopper accessory and drum mounting kit. In need of a replacement part for your air cleaner? We have those. Here are the parts (and part numbers) for the overhead air cleaners.